Nothing goes unseen on social media! You can tweet this and check the results for yourself. Ten, fifteen years ago, maybe you would have missed something that’s posted on social media networks. Today, that’s close to impossible. We are captivated by the power of social media, it’s a fact. And we, the users, are not the only ones – brands are also taking a substantial piece of the social media cake. With one look at these numbers, any CEO or manager should get chills down the back. Those numbers equal the possibilities for your business to be seen on social media. And if you know how to use these numbers right, you can significantly increase your brand awareness on social media networks. But are brands using this opportunity the right way? Or are they thinking that any social media marketing is good marketing? Unfortunately, it doesn’t really work that way. Inadequate social media marketing tactics can have catastrophic consequences for businesses. Let’s take a look at some examples. There are countless examples of how brands have used social media networks the wrong way just for the sake of growing their brand awareness. Only the last year, we have witnessed several social media bloopers. Let us mention two famous viral examples. Do you remember Yanny/Laurel audio that caused division among people? Many brands, and even politicians, quickly jumped into the debate over this viral audio. 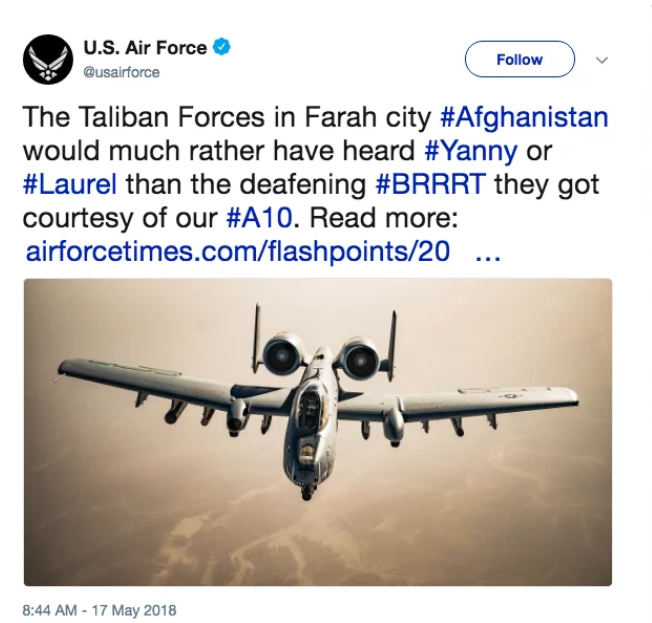 I won’t go into too much detail, but it seems like the U.S Air Force has crossed the line and their tweet received criticism from many social media users. Another viral story was the ad about a game on Snapchat. Named ‘Would You Rather?’, the ad took a different turn when it brought into play a sensitive topic – domestic violence. The ad was about the game ‘Would You Rather? where Snapchat gave the users two options: ‘Slap Rihanna’ or ‘Punch Chris Brown?’. Rihanna fired back with a statement which blamed Snapchat of “intentionally” shaming domestic violence survivors. This cost the app $800 millions. 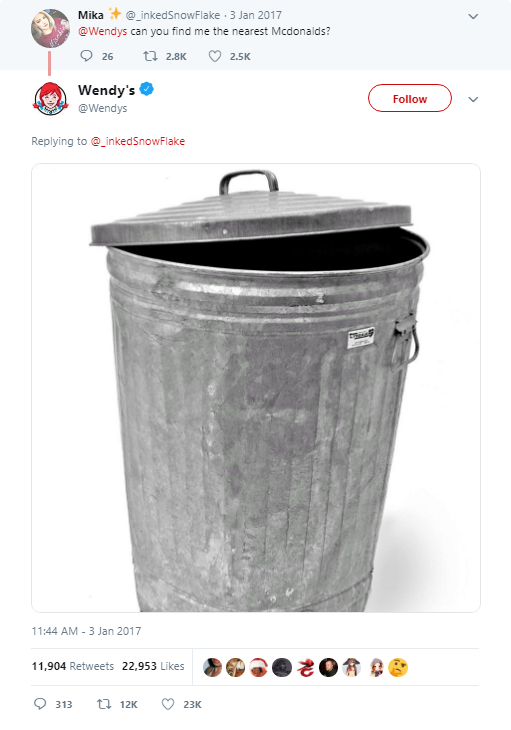 We can only imagine how the social media marketing team feels after that loss. Every wrong post on social media can cost your brand a fortune. In mentioned examples, the brands made the mistakes themselves. And the damage they’ve caused have cost them a lot of money and a lot of customers. But what happens if the competitors play on your mistakes on social media? There are many examples where your competitors may try to call off your brand’s value on social media. Let’s take a look at a specific example to prove our point. Check out these Wendy’s tweets about McDonald’s. They may have around 6.500 restaurants compared to McDonalds’s 37.000, but their social media game is on point. 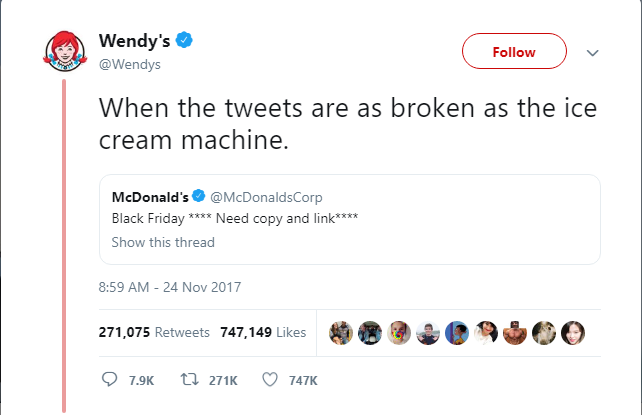 This tweet is just one example of how Wendy’s is using competitors mistake to attract their customers. And you may wonder how much harm can one tweet like this do to a brand like McDonald’s? One tweet, not that much. But multiple tweets over a more extended period, a lot. Most of the time, brands are self-centered on social media. They talk about their products or services, what’s new, how much they have improved over some period of time, etc. That’s all good and beneficial for increasing brand awareness. But, nobody likes when brands talk only about themselves. And then you have brands like Wendy’s who just waited for their competitor’s mistake to use it against them. Brands like these see an opportunity to shake things up with someone bigger and they use it. Repeatedly and successfully. Especially when the connotation is negative and used to shame the other party. Now you may wonder: how can the other brand quickly and effectively defend from similar situations? The answer is pretty simple – with the help of their employees. You don’t have to be a big name like Wendy’s or McDonald’s to be one step ahead of your competitors. What any enterprise needs are loyal and skillful employees. Enterprises don’t go solo in the social media ring. They have an army behind them, a social media tribe if you will. A social media tribe consists of the employees of your company who would willingly like to share the company’s content, products or services on their social media profiles. 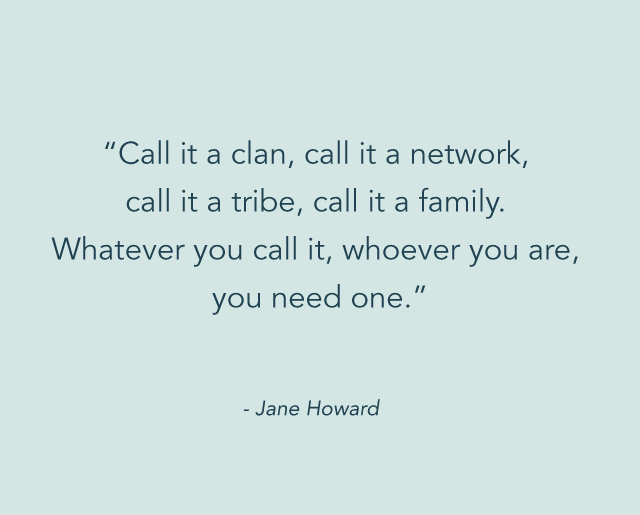 Jane Howard, an English novelist, has a great quote for this. Maybe her active years were a lot before the social media time, but this quote of hers is applicable even today. The company that can succeed without its people does not exist. And when it comes to social media, you can’t let somebody else play your own game. Let’s be real. Who knows your company history, mission, vision, products, and services better than your employees? That’s right, no one. Now, let’s see what you can do to create a powerful social media tribe from your employees. Just because you have a social media tribe, doesn’t mean that you need to be present on every social platform that exists. That’s just a wrong use of your employees’ valuable time. What you need to do is to make proper research and make data-driven decisions about the value of each social platform. This will help you determine which social network your target audience is most active and create your strategy based on your analysis. The goal of the tribe is to make sure your company is present on social media all the times. This will not only increase your brand awareness but will also show your audience that you are one responsible company that takes its audience seriously. Posting on social media just for the sake of posting is so 2013 strategy. Today, you should only post when you have something relevant to say to your audience…not just post the first thing that comes to your mind. You should always consider if the things you want to say will enrich your audience. 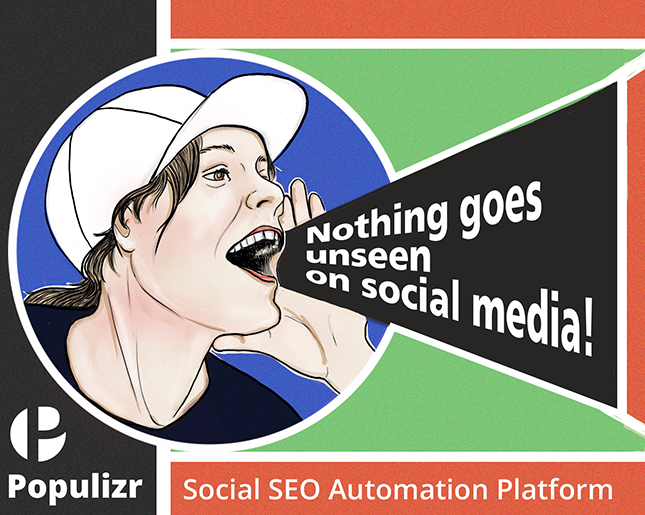 Your users are being bombarded with content on social media every second of the day. Which is why your social media tribe should make it easier for your followers to find you. Your tribe should stay updated with the latest trends in your industry and use the advantage of the hashtags to connect with the audience that’s in sync with your industry. What you have to say on social media is more important than how many times you’ll say it. Your social media tribe should create content that’s unique and easy to consume. Also, high-quality pictures and videos will always add to the value of your content. Your employees are the ones who can provide a fair fight for your company in the social media ring. Yes, it could be time-consuming and even extremely difficult at time to do this. But your employees know your brand and your products the best and they can present it or defend it the best. 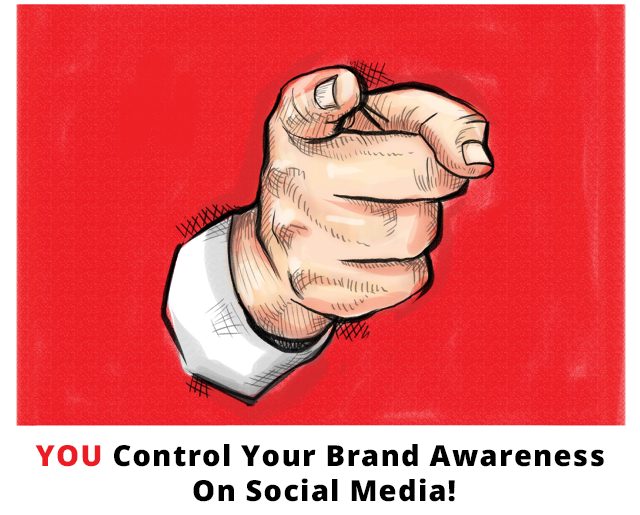 By now, you have probably concluded that every business has brand awareness on social media, whether they control it or not. Some brands have this idea that it’s enough just to be present on social media networks and occasionally post something. Others are constantly working on strategies that will strengthen their relationship with their customers. But social media is one extremely challenging game to play, where the number of users and competitors is continuously on the rise. That’s why it’s crucial to have a well-established strategy when it comes to increasing your brand awareness on social. A great part of that strategy will be your employees as a social media tribe that know your brand’s value, where to uplift the game, and how to answer to your competitors. Your employees are one highly effective way to control your brand awareness on social media. As we mentioned above, being a part of a social media tribe can sometimes be time-consuming for your employees. But, we have a solution. If you want to help your tribe control your brand awareness on social media in an easy, effective way, check out Populizr for Enterprise.